Another comic book movie hits the big screen and sets itself up to be something different. Venom is one of those 'in association with Marvel' movies, rather than an actual Marvel studios movie. For those who don't understand, Marvel don't own the film rights to several of their characters, including Spider-Man. However, Spider-Man has now appeared in the Avengers because Sony (who owns the rights) made a special deal with Marvel studios. The deal does not include the other characters attached to the Spider-Man universe, so Venom sits outside the Avengers world (at least at this stage). Venom is most commonly a villain, however, he has also been an antihero whenever he has branched out into his own solo comic series'. He previously appeared in live action via the much disliked Spider-Man 3 (2007), when he appeared as one of many villains, that time played by Topher Grace. Tom Hardy takes on the role this time around, and Hardy is no stranger to comic book movies, having famously played the villain Bane in the 2012 Batman film: The Dark Knight Rises. Hardy has built a strong career playing physically strong characters, often mumbling his dialogue to the point of being inaudible (The Revenant (2015) being the worst of these performances when it comes to diction). Hardy always brings a strong screen presence and this film is no exception. In fact, to say that Hardy's performance is easily the best thing about this film is probably a fair assertion to make. Comic book movies, and blockbusters in general, are in a strange place at the moment. These franchises fear that audiences will grow tired of the genre, as fatigue sets in due to and endless stream of films gracing the screen one after another. But whilst the overall box office figures don't suggest that fatigue has set in just yet, the rot appears to be showing signs of occurring, at least on the artistic side of things. The boom of the comic book movie really started in the early 2000s when the X-Men franchise began and took superheroes into a more serious tone than before. It then exploded when Christopher Nolan brought Batman back from the cheese-fest of the Kilmer / Clooney debacles, and then settled into its groove when Marvel found a formula that worked, before each company started to build massive interconnected universes. To avoid fatigue, audiences should be seeking out variety in the genre. However, the mass audiences have become too accustomed to the formula of Marvel movies and seem to have turned away from anything that is remotely dark. As a result, both DC and Fox (the X-Men franchises) are constantly altering their films in a desperate bid to be more like Marvel, and creatively, the genre is starting to fall by the wayside. So Venom's arrival appeared to be a little from left field. Could this film about an alien parasite that eats people be the tonic to cleanse the theatre of the formulaic residue of the most recent entry: Ant Man and the Wasp? The trailers seem to suggest so. Most of us thought the film would be rated R, or at least MA in Australia. It seemed logical for Venom to play to its more horror elements and try to be different to the other comic book movies. However, the film is only rated M, and for the most part, it's a pretty soft M. This might play well to the box office figures, as more 12 year old's are allowed to see it, but you can feel the cuts that remove any real gore from the movie and it softens the impact on the viewer. The film opens with a rather lengthy first act that takes its time to give you a mini story arc for Eddie Brock (Hardy), as his life turns for the worst as he can't help but try to do his job of investigative journalism with no compromises. The film introduces our human villain, Carlton Drake (Riz Ahmed) who is stylish and suave but clearly hiding evil intentions. There's the usual science labs and hi-tech business dealings, but this is just a means to an end, as the alien creature is what we all paid money to see. Drake has landed a rocket on an asteroid and brought a number of organisms to Earth called Symbiotes. Naturally, Drake wants to combine them with humans and he's not going to let regulations or ethics get in the way of that. In current day USA, I'm sure Donald Trump would reduce regulation to allow him to do whatever he wants to. Naturally, Eddie ends up coming into contact with one of the Symbiotes and it combines itself with Eddie successfully, turning into the creature Venom. The creature is shown only in glimpses in the beginning, and this is when it works at its best. 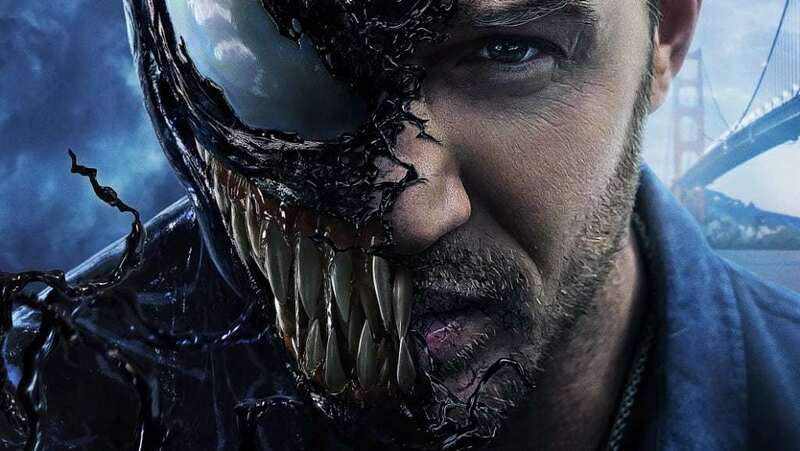 Hardy's performance is captivating and when the effects strip back and reveal Eddie, it's a far more interesting character than the CGI black plastic skinned monster. Not that the CGI isn't adequate, but there's little emotional performance from the beast. The first half of the film worked really well for me. Whilst I've heard people say the opening is too slow, I felt it worked well in establishing the world and the characters. To be honest, the first half felt like a DC movie, and that's my preferred style. There is a great motorcycle chases sequence that is quite lengthy, and is exceptionally well done, showing many cool aspects of what Venom can do to get out of tricky situations. There is plenty of action once Eddie and Venom become one and a little bit of humour here and there. However, the reveal of the CGI creature felt out of place with the previous focus of the story, as the tone established felt invaded by this very comic book movie looking creature. From the middle of the movie, the film started to fall off the rails for me. The film started to add more and more jokes into the script. The film suddenly goes into hyper speed and fails to feel like a three act movie, but rather a two act movie that is uneven, as the first act quite long, slow and measured and the second act feels like it skips over several events and the next thing you know, it's all over. There is a terribly filmed battle sequence between Venom and another symbiote called 'Riot'. This sequence was two CGI creatures, shown in close up through most of the fight, making it difficult to focus on and impossible to understand much of what was happening. By the time we get towards the end, featuring a very played out cameo from a certain cameo specialist, I couldn't help but feel slightly robbed of a story I had invested in for nearly an hour at the start. Is the film as terrible as some critics are saying? No, not at all. I think overall, most people in the theatre enjoyed it. Many film critics at the moment are extremely tough on anything that is remotely dark in tone, and any comic book movie that doesn't feature members of the Avengers, or follow the strict formula of the Marvel universe, has a hard time getting a decent score. If you go in with mid-level expectations, then you should find enough to make it worth the trip to the cinema. Please note, as someone who suffers from motion sickness and is easily affected by shaky cam, this film has left me feeling the effects of motion sickness since I left the theatre. The previously mentioned CGI monster fight sequence was particularly hard on my motion sensitive eyes, so please bear that in mind if you are afflicted by this annoying condition.